Amethyst crystals are a super conductor of electricity and far infrared rays (FIR). NASA determined FIR to be the most beneficial light wave for cardiovascular conditioning of astronauts in space. Visit this page to read about more benefits. The Biomat produces negative ions. Negative ions are mostly found in healthy, natural, fresh air environments, like in forests, or beside the ocean or streams. Breathing in negative-ion intense locations increases energy. 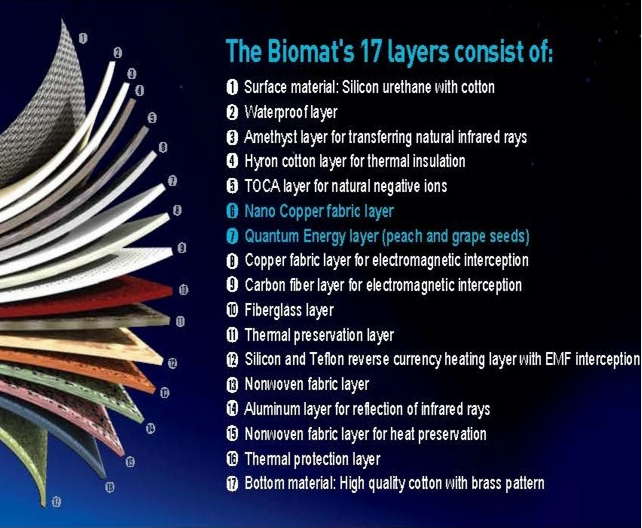 17 layers are contained in the mat (see below). Many claims are made about the benefits of this Biomat. I'm not a scientist or a doctor and cannot prove any of the statements I've seen on other web sites (like: it reduces stress and fatigue,increase blood circulation, supports the immune system, promotes restful sleep, relaxes muscles, reduces inflammation, helps rheumatoid arthritis, relieves minor muscle pain, among other claims.) I spent some time reading the very interesting information on this web site, and you might like to as well. I offer my own testimonial - I find the Biomat very relaxing and soothing. It minimizes my back pain and improves my sleep. The first time I tried it, I didn't stop thinking about this Biomat for a year-and-a-half until I bought it! As much as my clients enjoy the sound therapy - they are equally keen to get as much of their session time in on the Biomat as possible, which is why I combine both. Clients should wear comfortable clothing. They are fully clothed when laying down on the Biomat. Socks are also a must, at every time of year because as you relax, feet tend to get a little colder. Smokers are asked to bring a freshly-washed set of clothing in a closed plastic bag and change into them before the session. During the session their travel clothes should be placed into the bag and sealed. This is especially important to be respectful of subsequent non-smoking clients.